Sony Xperia Z Ultra price and release date revealed | What Hi-Fi? 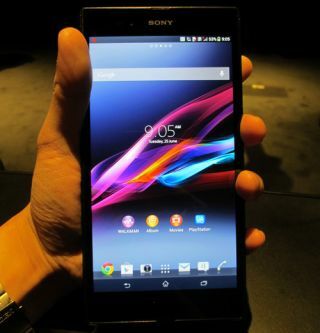 The new Sony Xperia Z Ultra, the 6.4in 'phablet' launched by Sony, looks set to go on sale for £600 in the UK. The Xperia Z Ultra price was originally leaked as 719 euros in Europe, reported by Dutch site Tablets Magazine, but Clove has now revealed a UK price as £600. We managed to get something approaching a more concrerte release date for the Z Ultra at the launch, too. Sony announced "Q3 2013" but we're told Sony is aiming for mid-September. Our eyes might be on the IFA show in Berlin which runs from 6-11 September for an official release. The £600 price for the SIM-free phone is available for pre-order now, with contract offerings likely to vary. This price puts it above the likes of the HTC One and Samsung Galaxy S4. The monster phone meets tablet sits above the flagship Xperia Z, and claims to be the world's thinnest Full HD phone, measuring just 6.5mm slim despite that huge 6.4in Triluminos display. For more details and pictures see our Hands on: Sony Xperia Z Ultra review.